Jembrana is not so well known by tourists. Most people are driving along the coast road when they arrive in Bali after a trip in Java. 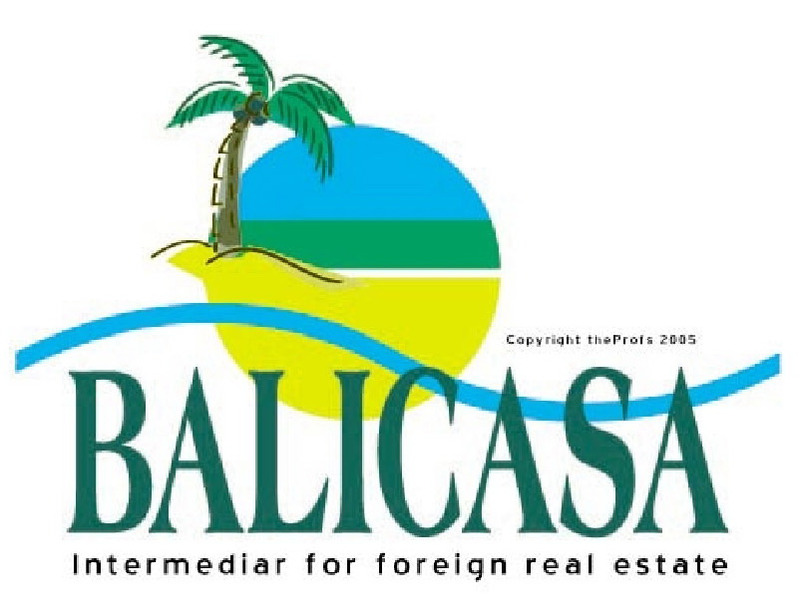 Most of the tourists are driving directly to their hotels in the Southern Part of Bali. Nevertheless, Jembrana has some attractive things for tourists to visit. This regency is thought to have been established in the early 1400's, although civil war broke out and the regency became part of the Badung regency. In the 17th century, sparsely populated Jembrana was not of much interest to the royal Balinese Kingdoms and for a time it was ruled over by a prince of Sulawesi. Jembrana was one of the first kingdoms to surrender to the invading Dutch in the 1800's. A small town on set along the main road between Denpasar and Gilimanuk. Negara itself does not have many tourist sites although it is famous for the bull races, held every year between July and October. The dates of the events vary from year to year. Information can be obtained at the Badung Tourist Promotion Boards office in Denpasar on these. Water buffalos are used to pull the tiny carts, gaily decorated for the occasions, at high speed down the race track. Held to celebrate the end of the rice harvesting season, the races are judged both on speed and style, and create and amazing spectacle, enthusiastically watched by crowds of local people as the bulls thunder down the narrow mud track, bells ringing and silken banners flying. A giant bamboo gamelan (orchestra) - is typical of Jembrana and is seldom heard outside the regency. This park is home to the rare Java Deer, the rarer Bali Starling and many other animals such as the Boss Javanicus, or wild bull. Famous for surfing, the long left handers are best in the morning before the wind gets up. The beach itself is not fantastic. Tourist accommodation ranges from guesthouses to smarter hotels with pools. 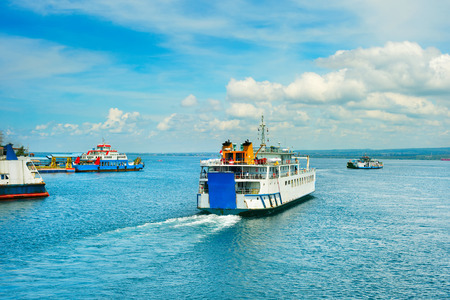 Bali's most western town, this is the ferrying point for people wishing to cross to Java. The tranquil bay is good for water sports and it is the closed place to stay if you want to visit West Bali National Park. A village just south of Gilimanuk, with prehistoric remains (Circa 1000BC). The headquarters of the National Park and visitors centre are located here. The dam is good for water sports and the nearby village of Palasari is one of the few Catholic communities in Bali. The church is quite distinctive. Large wide beach with views to Java. Very popular at weekends and holidays with the local community. This beach comes alive in August when the annual Jukung races take place. A Western facing beach with good sunset views. 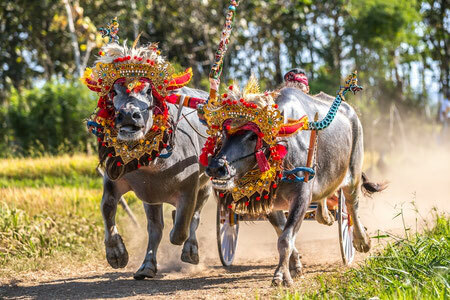 A small village in which Bali´s renowned Buffalo racing is performed for tourists. A reptile park and a riverside temple are other Perancak sites. 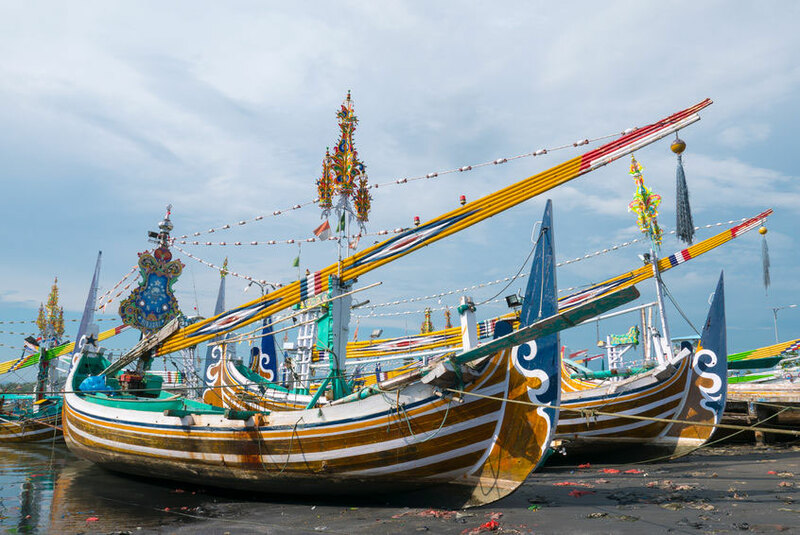 The village is named after its ancient temple, Pura Ancak, where the Hindu priest Dang Hyang Nirartha first set food on Bali. A popular beach with the occasional bull and horse race. One of Bali´s major cliff-top temples and the largest temple in West Bali. It was built in the 1500´s by the same priest that built both the Uluwatu and the Tanah Lot temples. The sunset from this vantage point is outstanding. The temple is located between the villages of Air Satang and Yeh Embang. A sacred banyan tree grows over the road, or rather the road goes through this very large tree, up into the foothills of west Bali and towards Pupuan. The surrounding area is tropical forest and has many impressive trees. The biggest fishing port on Bali, not an actual port but the sea is here at their calmest and there are no dangerous reefs. Twenty kilometers inland from Negara, the road climbs into the foothills. At Asah Duren, large clove plantations surround the village. In the past, the principal clove-growing areas in Indonesia were in Sumatra and Maluku, but in the last decade Bali has become a major producer. Traditional Balinese musical percussion instrument - brass xylophone Jegog with hammer, part of orchestra Gamelan. In the Northern part of West Bali, near the Jembrana border, are a large number of coffee plantations. This is where the Joged Bumbung music and dance groups are thought to have first originated. Flirtatious dance performances of similar genre are now popular throughout Bali. One particular group from Tegal Cangkring was so popular in the 1940´s that they used to take a wooden ox-cart to performances to carry home all the coffee they were given. 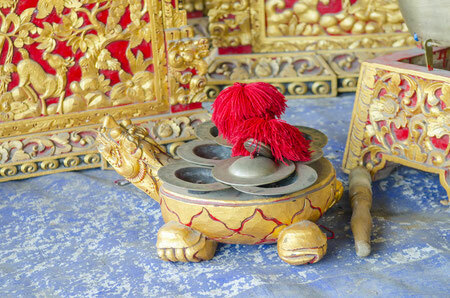 ¨Bumbung¨ means bamboo tube, and the instruments of the Joged consist of a number of bamboo xylophones. Another variety of these, known as the Jegog, are specific to the Jembrana region. These are made of such large bamboo that the players have to sit on their instruments. The sounds produced by these attractive instruments is mellow and haunting, very pleasing for the ears.